Summer vacation is here and my kids haven’t wasted any time starting the VACATION part of the summer. Vanessa had some girlfriends sleep over and they had a bonfire and slept on the trampoline. 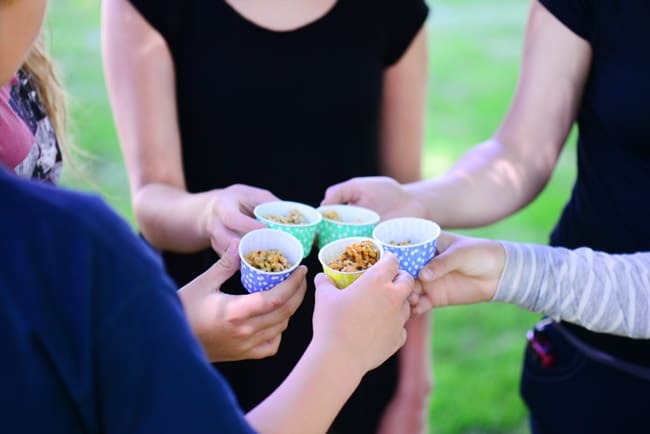 As part of the fun, we decided to have a summer tasting party with a blind taste test of the new Soy Vay® Popped Rice Clusters and the girls had a blast! About a month ago I shared a recipe for Hawaiian Steak Kabobs that I made using Soy Vay Island Teriyaki sauce. 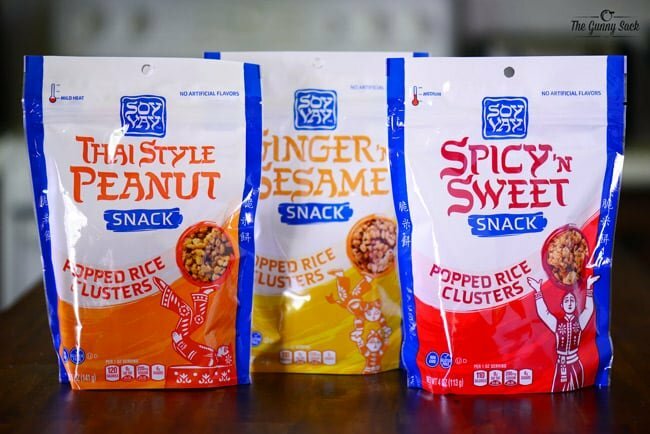 And now the team behind the Soy Vay sauces, dressings, and marinades, is taking their unique Asian-inspired flavors to the snack aisle with Soy Vay Popped Rice Clusters. Taking inspiration from Soy Vay’s line of marinades that use only premium ingredients, the snacks are gluten free, kosher and do not contain artificial flavors or artificial preservatives. They are made from non-GMO, high-quality ingredients including popped wild & brown rice topped with black sesame seeds, chia seeds & peanuts. 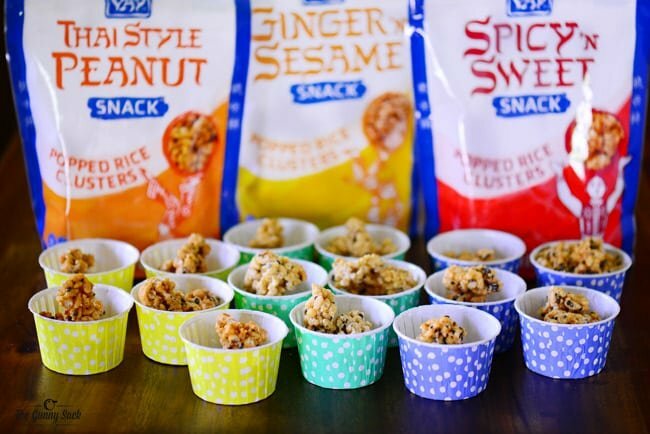 For the blind tasting, we used all three bold and unexpectedly awesome flavors of Soy Vay Popped Rice Clusters: Thai Style Peanut, Ginger ‘n Sesame, and Spicy ‘n Sweet. While the girls waited in another room, I divided the Soy Vay Popped Rice Clusters into colorful cups, one flavor per color. The yellow cups had Thai Style Peanut, the green cups had Ginger ‘n Sesame and the blue cups had Spicy ‘n Sweet. Then, I hid the bags where the kids couldn’t see them. The teens each took a cup and described what flavors they experienced when they tasted them. They described the Soy Vay Thai Style Peanut Popped Rice Clusters in the yellow cups as tasting like peanut butter, spicy and like peanut sauce. The Soy Vay Spicy ‘n Sweet Popped Rice Clusters were described as sweet, sour, like sesame chicken, spicy, and hot. The teens said the Soy Vay Ginger ‘n Sesame Popped Rice Clusters tasted sweet, of soy sauce, and a spice that they couldn’t identify. After they tried each flavor, I told them the names of the three flavors and they easily matched each cup with the right flavor. Some of the teens said the Thai Style Peanut flavor was their favorite and others said they love the heat of the Spicy ‘n Sweet flavor. I like all of them for different reasons but if I had to choose just one, I would probably choose the Thai Style Peanut flavor. 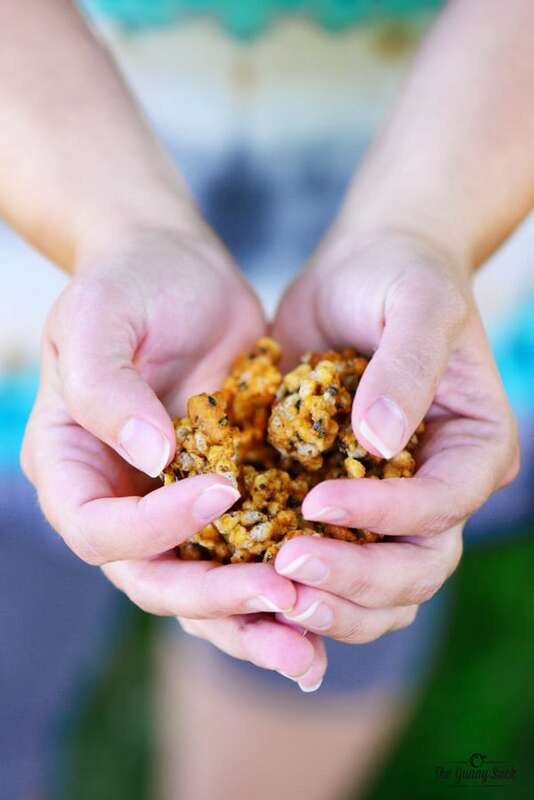 Soy Vay Popped Rice Clusters are the perfect choice for people who are looking for an exciting snack made using only the finest ingredients, that deliver bold, Asian-inspired flavors. 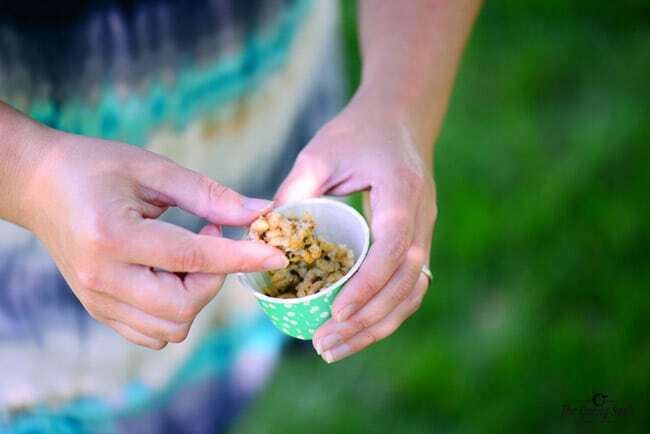 Host a summer tasting party of your own to see if your family and friends can figure out the flavors! This is a sponsored conversation written by me on behalf of Soy Vay. The opinions and text are all mine. What a great idea for a party! Love that first photo! Why can’t my parties be like yours?!? haha That’s so much fun! And so much deliciousness to share! ooo I bet that we would love the Soy Vay Spicy ‘n Sweet Popped Rice Clusters!! I tried these recently and LOVED them! Love the idea of a tasting party! That sounds fun! I’ve never heard of Soy Vay, thanks for the introduction! I am going to have to try these! They look and sound great! This is the second time I’ve seen these popped rice clusters today! I need them in my life ASAP!